Why do you need a crown? A crown is like a helmet for your head, but a helmet for your tooth. It helps strengthen and protect the damaged tooth and prevent it from suffering further damage. This could help give the tooth a much longer life-span. A crown cannot decay and is very difficult to stain, which means that it will remain similar colour throughout its life-time. It also helps to improve appearance, chewing ability and maintains the natural bite. Emax/Feldspathic: these are beautiful, aesthetic crowns, generally used for front teeth and on teeth within the smile line. Zirconia: these crowns are tooth coloured and extremely tough. Ideal for those back molar teeth to withstand the grinding and biting forces. Gold: extremely durable and strong, if you do not mind the slight bling in the mouth. Perfect for those back molar teeth that cannot be seen in the smile. You will require two visits for the crown, one for preparation/impression taking and the other for fitting of the crown. Local anaesthetics is used for both visits. 1st Visit: Before crowning of the tooth, old fillings may be removed. The tooth is then shaped delicately to a smaller shape by 1-2mm. After shaping, an impression is taken to record the new shape of the tooth. This impression is sent to the lab for the crown to be made uniquely to fit your tooth. A temporary crown will be attached after this appointment to protect the tooth. Avoid chewing anything hard on this side as the temporary crown is not as strong as the final crown. Good oral hygiene should still be maintained around the temporary crown. 2nd Visit: Temporary crown is removed and the new crown is placed over the reshaped tooth. The new crown will be checked for fit and colour before being cemented to the tooth. The crown should feel smooth and comfortable in your mouth. However, minor adjustment may be needed to achieve comfort. Crowns should last for many years and is unlikely to break. However, just like your natural teeth, crowns still require regular flossing and brushing, as decay underneath the crown contributes to the most amount of crown failure. Regular dental check-ups are advisable to pick up any early signs of problem. Tooth breakage during the preparation and shaping of the tooth. Infection of the nerve – there is a small risk that the nerve within the tooth may die and become infected. 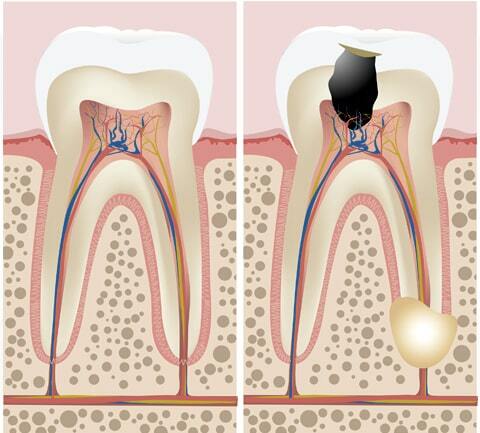 If this occurs, the tooth may need root canal treatment. Pain – there may be minor discomfort to the tooth or gum after crown preparation and placement. This could last for a few days. If pain persists, contact your dentist. Altered feeling – like all things, a crown may take sometime to adjust to. A crown will feel different to your original tooth but should not be uncomfortable or painful. Loose Crown – a correctly fitted crown should not come loose. Contact your dentist straight away if your new crown has any movement. Allergic Reaction – allergies to crown material is extremely rare. Contact your dentist straight away if there is any concerns. To find out more about Dental Crowns, please contact us. What Are Dental Bridges & How Can They Benefit You? Dental bridges are an incredibly popular, simple, and highly effective dental procedure – one that does what its name implies and performs cosmetic wonders: dental bridges quickly and efficiently work towardsliterally ‘bridging’ the gaps that are oftenleft by one or more missing teeth.A single bridge is comprised of up to two or more dental crownsfor the affected teeth, located on either side of the gap and a false tooth – or combination of false teeth – in between. The two or more ‘anchoring teeth’ are referred to asabutment teeth, while the false teeth are referred to aspontics. Pontics can be made from a wide variety of materials including gold, porcelain, or alloys – and even a combination of all these. Dental bridges can either be supported by an individual’s own natural teeth or prosthetic implants. If you’re suffering from unsightly gaps and unwanted spaces caused by missing or lost teeth, our team of highly trained dentists in Brisbane – with the help of high quality dental crowns – can work towards improving your quality of life by making your smile look significantly better. Be sure to contact us right away and we’ll get you closer to a noticeably more stunning and gorgeous smile in almost no time. Author newnhamfamilydentalPosted on September 27, 2018 October 2, 2018 Categories UncategorizedLeave a comment on What Are Dental Bridges & How Can They Benefit You? Besides brushing your teeth at least twice a day – in addition to flossing and regularly visiting a dentist – just how can you prevent plaque from wreaking havoc inside your mouth? Try to avoid – or at least limit – the foods below: the following are some of the most harmful foods for your teeth. Sour Candies: unsurprisingly, candy is bad for your teeth. However, sour candies contain even more combinations of different kinds of acids that adversely affect your teeth. Eating sugar and other carbs causes the plaque on your teeth to release tough acids: by attacking the enamel on your teeth, these acids can cause major cavities. The chewy sour candy varieties stick to your teeth for longer periods of time, meaning they’re much more likely to cause tooth decay. Craving sweets? Grab some chocolate instead: you can chew it quickly and wash it away easily. Bread: Whenever you chew bread, your saliva breaks its starchesdown into sugar. The bread – now transformed into a gummy substance similar to paste – effectively sticks to spaces between your teeth, causing cavities. Craving some carbs? Look to far less refined varieties of bread, like whole wheat: they contain less added sugars and aren’t as easily broken down. Alcohol: of course alcohol isn’t exactly healthy, but few people realise that drinking alcohol causes your mouth to dry out. A dry mouth is low on saliva, which is needed to keep teeth healthy. Saliva effectively prevents food from sticking to your teeth while washing away any remaining particles. It can even help to heal early signs ofgum disease, tooth decay, and other oral infections. Drinking plenty of water – in conjunction with using oral hydration solutions and fluoride rinses – works towards keeping your mouth hydrated. Visit our expert dental clinic in Brisbane for even more information. Typically, wisdom teeth don’t usually need to be removed: in fact, most don’t ever require extraction – even if they are impacted. So long as they aren’t causing any major issues, there’s no proven benefit of having your wisdom teeth removed. When performed improperly, the extraction procedure carries increased risks of encountering complications. However, problematic wisdom teeth do need to be removed: these are teeth that have yet to fully break through the surface of the gum or ones that have become impacted. tooth decay: whenever plaque begins to break down the surface of your teeth, dental caries tend to develop. In becoming more advanced, tooth decay can leave cavities and holes in teeth – which can even affect any surrounding teeth. gum disease: also known as periodontal disease, gingivitis occurs when plaque releases toxins that irritate your gums. These toxins subsequently cause inflammation and makeyour gums red, painful, andswollen. Gum disease can also affect surrounding teeth and even the bone around your wisdom teeth. pericoronitis: this occurs when plaque causesthe soft tissue that surrounds the wisdom tooth to become infected. cellulitis: a bacterial infection caused by particularly problematic wisdom teeth that develops in thethroat, tongue, orcheek. abscesses: these are caused by the collection of pus in wisdom teeth or any surrounding tissue – typically due to a bacterial infection. Very rarely, a wisdom tooth that hasn’t yet cut through the gum causes cysts – swellings filled with fluid – and other benign growths to develop. If you experience any of these significant dental problems, you may require wisdom teeth extraction: our Brisbane based cosmetic dentist canoffer you comprehensive treatment solutions today. The following five tips serve as a great way of keeping your mouth healthier for longer. 1. Pay your dentist a visit: by booking an appointment with your dentist at least twice a year, you’ll effectively be catching problems such as gum disease, tooth decay, oral trauma, or mouth cancer at their earliest stages – that is, when these conditions are easier to have treated and more affordable to take care of. 2. Switch from soda: though fun, soda’s fizziness is also part of the reason why it’s so bad for you. The major ingredients that give soda its ‘bite’ – phosphoric and citric acid – also eat away at your teeth. A can or more a day softens your teeth’s enamel, making them more susceptible to cavities. Our amalgam free fillings can help repair any damage. 3. Ditch the sweets: a major cause of tooth decay, sugar fuels bacteria and acidity inside your mouth. This causes plaque to develop and eat away at your enamel and gums. Expert tooth whitening services can fix yellow looking teeth. For even better aesthetics, dental crowns and veneers are a better and longer lasting option. 4. The right tools: use a toothbrush with soft bristles – this should last you up to three months. If you notice any bent bristles, it’s time to look for a replacement. A straight bristle tip – once blunted instead of rounded – can cause injury to your teeth and your gums. 5. Don’t forget to floss: flossing works towards fostering healthier gums and teeth. Be sure to unroll a fresh section for each tooth, keeping the floss tight to break up plaque while also leaving your gums in as good a shape as possible. For the best in dental hygiene advice – as well as a whole host of oral health care solutions – look no further than our team of professionally qualified cosmetic dentists based here in Brisbane. What are wisdom teeth? Wisdom teeth are those most back teeth in your mouth – the molars – that come through and grow out last during oral development. They typically emerge during your late teens or early twenties. Normally, two wisdom teeth are found in the upper jaw, with two teeth down in the lower jaw. However, there are some people who have less than four molars while others may have no sets of wisdom teeth at all. During growth, there are also times when the wisdom tooth emerges at an unnatural angle – this often causes it to push into the gums or even the tooth beside it. This is a problem known as impaction: growing at an angle renders a wisdom tooth completely useless – as it can’t help with chewing – and oftentimes causes extreme pain and that particular wisdom tooth may need removal. Unfortunately, wisdom teeth are also problematic in other ways, too. Wisdom teeth require ample room to grow: without enough space in the jaw for optimal growth, this can stop them from coming through as they should. Wisdom teeth can be painful: brushing or even flossing these teeth can be incredibly difficult. As food and bacteria typically get stuck between the wisdom tooth and its adjoining tooth, this can lead to serious tooth decay and troubling gum infections. So what’s the best course of action for problematic wisdom teeth? Unfortunately, wisdom teeth do not usually cause any pain or discomfort until it is almost too late – that is, until they start doing damage. As such, it is best to discover if your wisdom teeth are likely to cause you any problems sooner rather than later. Fortunately, the roots of wisdom teeth are still forming during adolescence, so this often makes for the optimal time of removal. Waiting later in life to extract them, once the roots have fully formed, can be problematic and complicated – especially considering the increased risk of infection. Red gums near the suspect wisdom tooth; the emergence of pus from the gum itself; in addition to swelling, pain, and inflammation. Lymph glands located beneath the jaw may also become sore and swollen – this may cause you difficulty in swallowing or even opening your mouth. Feverish symptoms are also common. There are, however, a number of ways to combat an infected wisdom tooth quickly and efficiently. Infections caused by wisdom teeth are often simply treated with antibiotics. Though this can serve as an effective albeit temporary solution, the infection, however, may return and persist: in fact, symptoms can keep coming back until the problem wisdom teeth are properly removed. Accurate X-Rays can assist in judging whether or not your wisdom teeth might start causing you problems. However, some wisdom teeth never cause any issues and do not require removal at all. In some cases, your dentist or oral surgeon may only need to make a minor incision to a small part of your gums in order to help wisdom teeth emerge. If they do need extracting, a local or general anaesthetic will be used, making the procedure completely painless. As wisdom teeth are large, the space where the tooth once was may require stitching in order to help it heal quickly and properly. In this case, it’s perfectly normal for both your gums and jaw to be sore, swollen and even bleed for as many as a few days after having a wisdom tooth removed. Teeth whitening is one of the most widespread dental services offered, and with good reason: as a fast and effective form of cosmetic treatment, whitening your teeth serves as a simple and non-invasive method of achieving a truly stunning smile in next to no time. However, before you go about getting yourself a brighter smile, there are a few important things you should consider first. When it comes to professional teeth whitening services, assessing your smile is the first step in undertaking this quick and painless procedure. In order to determine the most effective treatment plan – an appropriate course of action personally tailored to you and your unique circumstances – your dentist will perform a thorough and comprehensive assessment. In this way, they will be able to help you discover the best way in which to both renew and reinvigorate your smile. Determining the need for updating any fillings or crowns you may have. As your current set of crowns and veneers will not change colour along with the rest of your teeth, discolouration after the whitening process may be an issue. Your dental professional will subsequently take an impression of both the upper and lower sets of your teeth, once your teeth and your gums have undergone assessment. Custom designed whitening trays will then be made to fit you and your teeth, based on these two sets of impressions. After the trays have been made and are ready for pick up, all that is left for you to do is simply call into the surgery and collect your teeth whitening materials and instructions. The trays will serve to gradually whiten your teeth as you wear them for a few hours each day or leave them on overnight. Keep brushing your teeth! Brushing your teeth twice a day for a minimum of two minutes while using a fluoride based toothpaste ultimately helps to optimise the whitening effects. Start flossing: by flossing your teeth at least once a day, you will be helping to reduce the build-up of any nasty plaque and tartar in between your teeth. Help your teeth get rid of excess debris after eating and drinking by chewing sugar free gum. Drinking water throughout the day also aids in washing away any remaining food and drink. Be sure to keep visiting your dentist: don’t forget to drop in for regular check-ups and keep up with consistent cleaning. These are both quick, easy, and inexpensive ways of serving to improve your oral health in addition to keeping those new pearly whites of yours gleaming brightly. Making sure your children’s teeth are kept clean and properly maintained at home is just as important as those regular trips to the dentist themselves! Regular and comprehensive maintenance in conjunction with consistency are both key factors that have an enormous influence on the health and wellbeing of your child’s dental condition. The following are just some handy hints to help parents and guardians look after their children’s teeth in the best way possible. To ensure that your child’s oral hygiene – Don’t forget to brush your child’s teeth twice a day: their teeth should be cleaned both after eating meals as well as right before bed. It is important to use small circular motions during brushing in addition to a fluoride based toothpaste – one that’s suitable for children and their sensitive teeth. This aids in strengthening the outside of teeth and hardening tooth enamel – in addition to preventing the development of nasty plaque and decay. Work on getting your children into a regular tooth brushing routine: give them plenty of praise whenever they keep to it and brush their teeth well! Once again, consistency is key and one of the most efficient ways of developing positive behaviours and consistent, adaptive habits is through positive reinforcement. Don’t forget to properly maintain the tools and instruments used for tooth brushing – brushing with an old toothbrush can do more harm than good, as it serves as a breeding ground for a whole host of bacteria and germs. Toothbrushes and toothbrush heads start to get old and worn out roughly around the three month mark, so it is vitally important to replace them regularly for optimal dental health. Until your child is at least seven years old, you should be the one supervising and helping them keep on track with their brushing. Even once they start brushing by themselves, be sure to check in on your child each and every day to make sure that they are doing it properly. Don’t forget to positively reinforce them if you notice they are still keeping to their routine – even more so now that they are taking full responsibility for their tooth brushing habits. Dental check-ups from qualified, experienced and fully trained oral health professional for your child are very important in ensuring a healthy smile. Be sure to stay consistent and regular in keeping dentist appointments – ideally twice a year once your child reaches the age of two. It is also vitally important to keep your dentist in the loop: making sure your dentist is well informed with how your children’s teeth are travelling is an undeniably important part of looking after their teeth. Once your child’s adult teeth start growing and coming through, they may start to experience natural symptoms of pain and discomfort. However, these symptoms may be due to misaligned teeth which can have a lasting effect on your child’s dental health – even leading to improper jaw positioning and permanent misalignment. By keeping your dentist aware of any and all developments concerning your child’s teeth, they’ll be able to properly advise you on any efficient solutions and corrective treatment options if necessary. In the meantime, ensure your child’s diet is healthy and well balanced with plenty of fresh fruit and tasty vegetables. Water is also great at keeping your child’s teeth healthy. Be sure to leave sweet treats, junk foods, and sugary soft drinks to a minimum – mealtimes and special occasions are more than enough to indulge in these! When it comes to the best in cosmetic dentistry, look no further than Newnham Family Dental: we offer a huge range of premium quality dental treatment options including teeth whitening, dental veneers, and dental crowns. Our state-of-the-art facility ensures that patients receive the highest level of dental care possible for truly brilliant smiles. Most smiles can easily be improved in a number of simple yet cost-effective ways: focusing on tooth discolouration, shaping the teeth, properly re-positioning them and even carefully reducing their size can all work wonders for a better smile. Cosmetic dentistry enhancements differ greatly in their sophistication and scope: an efficient cleaning and polishing appointment in conjunction with a tooth whitening session serves as an effective solution for many – for others, more specialised and elaborate corrective procedures may be necessary. We’re proud to provide our wide selection of patients with painless and affordable options to give you more confidence in having a great smile. The latest approaches in cosmetic dentistry include virtually invisible internal braces as well as porcelain crowns, fillings, and veneers. Our highly skilled and supportive dentists can also help you formulate a comprehensive oral hygiene plan in order to keep your teeth shining bright while making sure your gums stay healthy. Servicing areas such as Mount Gravatt and Wishart, our South Brisbane clinic provides a comfortable and calming family-friendly atmosphere. Our warm and caring team of professionals understand that visiting a dentist can often result in tense and anxiety-provoking experiences: by making you feel right at home in our fully-outfitted facility, we’ll make sure they don’t always have to be. For more information on cosmetic dentistry contact us on 07 3172 5718 or make an online booking by clicking here. Newnham Family Dental Clinic in Brisbane is easily accessible by public transport.